Detroit Mayor Mike Duggan is a disciplined speaker whose message rarely varies from the nitty-gritty ways he and his administration are repairing the wounded city they inherited: Improving emergency response times, auctioning vacant homes, turning on street lights, demolishing abandoned property and trying to lower auto insurance rates. The mayor does not appear to consider himself a master builder, and virtually never talks about what grand vision he might have for Detroit beyond a community that works like most large American cities. Yet inside Duggan’s administration, his top officials are working on groundbreaking plans that could transform large swaths of Detroit. If the plans come to fruition, they could turn the city into a global showplace for how struggling cities can capitalize on shrinking populations. Cox and his aides are drawing maps that throw out traditional neighborhood boundaries and combine largely vacant areas of the city areas with more stable neighborhoods nearby. Cox and his aides are drawing maps that throw out traditional neighborhood boundaries and combine largely vacant areas of the city with more stable neighborhoods nearby. The purpose of the new districts is to take existing empty green space, refashion it, and use it to benefit both the distressed and stable neighborhoods. “This is a very different way of thinking of neighborhood development,” Cox told Bridge recently in a bare office at city hall that had several maps of Detroit neighborhoods on the floor. “It’s thinking about the vacancy (in troubled areas) in conjunction with stable neighborhoods which are right next door, and it’s all a part of one unit,” he said. Cox, reaching for a map, pointed to Rosedale Park, Grandmont and Brightmoor, three neighborhoods in northwest Detroit. Rosedale and Grandmont are stable areas mostly filled with gracious brick homes and landscaped lawns. Brightmoor has long been one of Detroit poorest areas, with extensive blight and vacant land. “Whenever we map the city, we never map Brightmoor without mapping Brightmoor, Grandmont, Rosedale,” Cox said. And the reason for that, he said, is that Brightmoor’s vacant land can be turned into productive acreage that works for both its remaining residents and those in nearby Rosedale and Grandmont. What constitutes “productive” land? Cox said empty lots in Brightmoor will be remade for recreation, nature, agriculture or so-called green and blue infrastructure, with engineered plots of land with plants and trees to dispose of stormwater or alleviate air pollution. 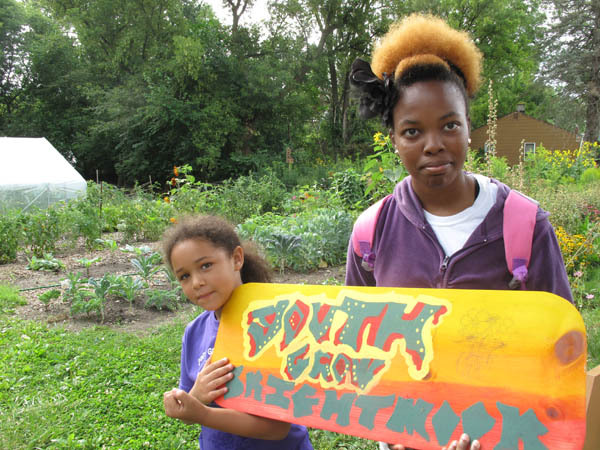 Along with its blight, Brightmoor already has some of the most extensively developed agriculture in the city. Cox said Brightmoor residents eventually will benefit by living near carefully landscaped property, including parkland and wooded areas, rather than amid the wild and trash-filled parcels that mark many parts of the landscape now. “We will have a strategy of how to steward that land, that vacant land within the city, and make it contribute to why someone would actually want to live in Grandmont-Rosedale,” Cox said. He was less specific when asked about funding for the plans, or when residents might start to see construction. On August 7, officials announced $8.9 million in federal funds will be spent for storm management in three Detroit neighborhoods, including for green infrastructure in Brightmoor. The idea of using Detroit’s vacant land for innovative purposes beyond agriculture has been percolating among experts and various community groups for several years, but such discussions have been largely theoretical beyond the city’s numerous vegetable gardens and such projects as the “green corridor” of trees that the Greening of Detroit organization quarterbacked last year along the Southfield Freeway to reduce storm-water runoff, pollution and noise while providing shade and a non-motorized greenway around the city. Repurposing the city’s vacant land was one of the foremost proposals of the Detroit Future City recommendations unveiled in 2013, and significant green infrastructure plans have been hatched even before the Aug. 7 announcement. What’s new is the Duggan administration’s plans, never officially announced, to yoke together neighborhoods in overhauling vacant land. Cox’s description of the plans he and officials from several departments are drawing up marks the first time city officials have moved on implementing a broad strategy, influenced by Detroit Future City, aimed at making over the empty parcels and linking them with thriving neighborhoods. Detroit Future City (DFC) is the sophisticated and somewhat controversial planning framework that was the product of the administration of former Mayor Dave Bing and seven philanthropies: Kresge Foundation, Ford Foundation, W.K. Kellogg Foundation, John S. and James L. Knight Foundation, Hudson Webber Foundation and the Community Foundation for Southeast Michigan. DFC’s influence has rarely been acknowledged as playing such an influential role in how Duggan and his aides are envisioning tomorrow’s Detroit. The vacant-land strategy, while designed to help depopulated areas, is also intended to bolster stable neighborhoods by creating nearby land for recreation or nature. The DFC framework also recommends strengthening vibrant districts, a strategy Duggan has already pursued through demolitions, vacant-house auctions, side-lot sales and nuisance-abatement lawsuits in specific neighborhoods. Taking other maps off the floor, Cox looked at far east-side neighborhoods centered around E. Warren Avenue and Cadieux, and, on the west side, around W. McNichols and Livernois, between the University of Detroit Mercy and Marygrove College. Both maps have thick red lines that tie together the prosperous districts with nearby areas that contained acres of city-owned land filled with abandoned houses and overgrown lots. Green areas inside residential neighborhoods could make Detroit a leader in sustainable land use, the Detroit Future City framework said. Credit: Detroit Future City. Cox was firm on one important point: Under the new plans, no one will have to move from the largely vacant neighborhoods, a fear among many Detroit residents who recall urban renewal projects that displaced thousands of Detroiters, notably African Americans, from the 1950s through the 1980s. Cox said that fixing up the shabby, and what he called “intimidating,” abandoned property will enhance the surroundings for those who remain. The challenge, he said, is to make sure the land has the rural look that many of the remaining residents in these ramshackle areas say they want. “Some of us who think of cities in their most urban face kind of forget that people have enjoyed a kind of rural lifestyle within the city,” he said. Tom Goddeeris, executive director of the Grandmont Rosedale Development Corporation, said he met Cox recently when he came to the neighborhood to discuss strengthening the commercial corridor along Grand River Avenue, another of Cox’s priorities. Cox didn’t talk about his land-transformation plan, but Goddeeris said the general outlines make sense. “A key to rolling it out will be to consult the people who live in those areas as early as possible,” he said. Engaging residents at every stage was a key component of the DFC plan. Peter Hammer, director of the Damon Keith Center for Civil Rights at the Wayne State University Law School, which promotes the educational, economic and political power of underrepresented communities across southeast Michigan, has criticized DFC for limiting its planning solutions to Detroit – as opposed to looking at regional possibilities – and for what he said was the plan’s failure to address the issue of race. Detroit has lost more than 60 percent of its 1950 population of 1.8 million. As abandoned buildings and houses were torn down, the result – vacant land – has vexed mayors for decades. As Duggan tears down abandoned homes at a rapid pace – he said the city demolished 150 houses during a week in late July – the amount of empty land continues to grow. It’s now 23.4 square miles, according to Dan Kinkead, Detroit Future City’s interim director, or roughly 17 percent of Detroit’s 140 square miles. In the 1970s, as the population fell and empty land began to expand, the city enclosed many of the vacant acres in central Detroit with white wooden fences that resembled farm stockades. But the vast, open fields kept growing. In 1993, the city ombudsman, Marie Farrell-Donaldson, ignited an uproar in the city – and news coverage nationally – when she proposed moving residents from mostly abandoned neighborhoods into city-owned homes elsewhere. The depopulated neighborhoods would be sealed, stripped of services and declared off limits, supposedly saving tax dollars. That plan went nowhere, but fear of forced removal has remained strong among Detroiters who live in marginal neighborhoods. Until the past several years, most mayors over the past half century devised policies intended to repopulate Detroit’s emptying neighborhoods; they proposed filling empty land with redevelopment, such as housing. While a number of new homes have been constructed, that was hardly a widespread solution as Detroit’s massive geographic footprint continued to empty out, losing 25 percent of its population between 2000 and 2010 alone. Urban designers have long proposed various shrinking solutions for distressed cities, and the idea of re-thinking Detroit’s vacant neighborhoods became an issue during the mayoral campaign in 2009 after Kwame Kilpatrick had resigned as mayor in 2008. The winner, Bing, acted on the notion, and went to the Troy-based Kresge Foundation in 2010 and asked for help in planning. He told Kresge officials what had been clear for decades: that Detroit did not have the resources to serve its 140 square miles, recalled Laura Trudeau, managing director of Kresge’s Detroit and community development program. Trudeau said Kresge suggested a process that combined a planning team of local and national experts with significant community input, and that’s how Detroit Future City was born. The process included hundreds of meetings and survey responses from 70,000 people. It was controversial at times. Some larger community meetings degenerated into shouting sessions. Bing suggested residents of depleted neighborhoods might have to move. Kresge and city hall sometimes butted heads, though Rip Rapson, Kresge's president and CEO, said some media coverage of the reported rift was "completely out of context." In January 2013, officials unveiled the 347-page Detroit Future City strategic framework in a celebratory news conference headed by Bing and Rapson, who said Kresge would spend $150 million over five years on projects aligned with DFC recommendations. The plan comes in a book with multi-colored maps, charts and hundreds of proposals about how Detroit can look in 50 years, if the plan is implemented. Joining vacant areas to stable neighborhoods was mentioned on one page. Among the plan’s most prominent proposals was to more heavily populate residential and commercial areas and take advantage of the empty land. But the plan fell out of the headlines after the launch – until Duggan and Cox came along. Less than two months after Detroit Future City was unveiled in January 2013, Gov. Rick Snyder declared the city was in a financial emergency. For the next two years, the plan was overshadowed as officials were consumed with the Detroit’s bankruptcy and mayoral election, which Duggan won. To keep the DFC flame burning, though, city and philanthropic officials opened a Detroit Future City implementation office in 2013 that has worked quietly to coordinate planning efforts among a variety of community, government and nonprofit groups around such projects as small-scale green infrastructure and marketing for the old industrial corridor along Mt. Elliott Avenue north of I-94 on the near northeast side. Kresge continued to make grants aligned with the plan. Supported by philanthropy but tethered to city government through one of its development arms, the Detroit Economic Growth Corporation, Detroit Future City has remained a vague entity to many residents and observers. That status got murkier in June when it was announced that Ken Cockrel Jr., the former Detroit City Council President who served a short time as mayor in 2008 and 2009, would leave his job as executive director of the implementation office and the office would be reorganized as a nonprofit with a new director. Since taking office, Duggan has hardly ever spoken in public about Detroit Future City. In 2013, when the DFC plans were unveiled and he was running for mayor, he called it “a very valuable contribution.” In February 2014, his development czar, Tom Lewand Sr. was quoted in the Free Press as calling the book his bible. But the city’s quiet development plans are being watched around the country. Detroit Future City's map sees the way land could be used in 50 years. Credit: Detroit Future City. Observers, such as Janice Bockmeyer, a professor of political science at John Jay College in New York, are paying attention to how foundations, like Kresge, collaborate with a city bureaucracy with fewer of its own planners on staff. Kresge’s Trudeau said philanthropic organizations work to build consensus within communities, not make decisions for them. She cited an initiative called Kresge Innovative Projects: Detroit, which solicits applications from across the city from community-based organizations seeking to transform their neighborhoods. Cox, 55, grew up in Brooklyn, N.Y., and came to Detroit from New Orleans, where he was director of the Tulane City Center and associate dean for community engagement at the Tulane University School of Architecture. He served as mayor of Charlottesville, Va., from 2002 to 2004 and two terms on the city council; he was also an architect on the faculty of the University of Virginia. Cox lives in Lafayette Park with his wife and bikes to his office in Detroit’s City Hall. In June, during a conversation with CNN’s Suzanne Malveaux at the Max M. Fisher Center during a national conference of urban activists, Cox compared his new job to riding a roller coaster. Asked by Bridge about the influence of the DFC on his work for Duggan, Cox said the plan “reframed the conversation that Detroit was having about its development” by saying the city needs to pursue a higher density of housing and commerce and concentrate it in neighborhoods that already are viable, all while putting vast areas of empty land to productive use. “It had a whole menu of buzz words like ‘blue infrastructure’ and ‘green infrastructure,’” Cox said, “a strong kind of environmental ethic. “I felt like, wow, here’s a community that has accepted that it is not going to grow everywhere. And Detroit Future City gave Detroit that template. It said there are these large swaths of land where you don’t need to grow your population. You can grow your population over here” in stable neighborhoods. It would be great to see Detroit come back as a new city, redesigned for the 21st century. I could see this happening if it wasn't for the politicians, both at the local and state level. Sadly, party politics (self-interest crooked politicians) and special interest groups will make this project difficult if not almost impossible. Party politics and special interest groups is what brought Detroit to its knees, and unless people (of all backgrounds, incomes, races and religions) can come together together to demand this separation stop it just won't happen. People remember, America is unique because it is a melting pot and should not be run by only certain groups or certain people. Let's try to remain optimistic and believe this can happen by taking responsibility for this project and becoming involved even at the local level. Thanks so much for this excellent story that offers a rare inside look at Mayor Duggan's directions for the state's most important city. We applaud the Mayor and Mr. Cox for their innovative strategy and sincerely hope for its success. Crime and schools. All the urban design in the world won't make people move back and buy your house until one or both of those are fixed. The hipsters don't care as much about crime but they may eventually have kids and settle down. Very interesting look at land use and neighborhoods. But how will people get to and around these neighborhoods? Transportation, and especially reliable public transit, MUST be an central part of these discussions. I worked in community development in Detroit under June Thomas and have also worked on plans for Brightmoor up until the DFC plan. I'm not sure if any of this is news, yet another big city planning director has been cycled through, CDCs are complaining about not having enough money. The only thing that's been added to the conversation is the purposeful deconstruction of Detroit, which is the antithesis of urban planning. Detroit is not too big, it's much smaller in area than booming sunbelt and west coast cities. The problem with Detroit is one of people and interest. Like Yogi Berra said: "If the fans don't come out to the ball park, you can't stop them." "Purposeful deconstruction" is a perspective that is destructive. We can choose to look at this as "intentional repurposing." The deconstruction has been happening for decades, it's time to admit this to ourselves and deal with the city as it is, not as we imagine it was 50 years ago. As for "booming sun belt cities," they have their own problems, many related to the sprawl you mention. Detroit is the size it is with the number of people who live here and the number of people who commute here for work. I applaud Bing and Duggan for dragging the community into today's reality. A little more effort needs to exerted to drag the State and Federal governments into the 21st century, too. Yeah right, all this unidentified ag and greenspace will remain repurposed until Pulte comes in for a new subdivision. Detroit would kill for Houston's "problems"
In North Corktown we would call Cox a genius if he can do this with our part of "the plan" "Cox said that fixing up the shabby, and what he called “intimidating,” abandoned property will enhance the surroundings for those who remain. The challenge, he said, is to make sure the land has the rural look that many of the remaining residents in these ramshackle areas say they want. . . people have enjoyed a kind of rural lifestyle within the city,” he said. I'd like to see a few manufactured housing communities go up on some of the empty land. There are more than a few city -owned abandoned, dangerous,open-to-tresspass properties on my well-traveled block(both pedestrians, young and old, and automobiles), the worst is a property at 13635 Ryan, looking and standing as it is since 2007, the first abandoned house on the block. Long-time residents,mostly homeowners, cut the grass in front of these empty properties and shovel the snow. When, if ever, will these eyesores north of E.Davison and south of E.McNichols(6 Mile) be demolished or restored. I have seen a proposed plan for city's twenty-some mile greenspace path that includes part of 6 Mile to Ryan,south on Ryan to Luce,east to Fenelon, south on Fenelon thru Jayne Field and Lasky Park to Hamtramck, etc.... Lots of possibilites for community enhancement,rebuilding,restoration with this plan. But first the blight must be cleared.Neighborhood public transit is also important for future growth. Also the Conant(Route 12-starts at Fairgrounds Transit Center)bus used to go through Belle Isle years ago, today it stops at E.Jefferson@Concord(by Big Boys). It would be nice to have this route extended through our newest state park. Also it would be nice to restore daytime Saturday bus service to Eastern Market on the Russell(Route 40) Route. I've been watching the demolition of abandoned properties. I am wondering if the basements are being broken up or just filled in. If they are filled with debris and filled with dirt, what becomes of the sewers? If the sewers from the filled in basements to the main sewer lines fill with dirt, that dirt seeps and washes into the main sewers, how will waste from occupied homes reach the sewerage treatment plants? You can't talk about creating vacant land in Detroit without being aware of the sewer lines and water mains beneath it. Detroit's infrastructure is old and has not been maintained for decades. There has to be a plan in place for the underground infrastructure as well as for what is on the surface. A very good and informative article. I was particularly impressed that it recalled Marie Farrell-Donaldson's original idea, clumsily delivered with no political support, to re-concentrate population into viable nodes of the City. In some ways, albeit more artfully, the DFC plan takes her idea and runs with it. The DFC plan is a remarkable planning document. It is a necessary blueprint on how to utilize 148 square miles of land that once accommodated 1.8 million people. It is also responsive to economic, social, and environmental realities and may serve as an important guide for other cities that have suffered substantial disinvestment over a prolonged period of time. Saying that, my one criticism of the DFC plan process was that it seemed to occur in a legal vacuum. I appreciate that Kresge put a lot of money toward creating and supporting the plan implementation, but I also think they should have worked with the City's government to have the plan, or parts of the plan, adopted as the City's new comprehensive plan. Giving the DFC plan legislative legitimacy will enable the City to prioritize plan projects through budget cycles. Doing so will also mesh the adopted DFC plan components with other City programs, policies, and legislative initiatives. The City has more than there fair share of philanthropic organizations like Kresge willing to support ideas. The problem is that the have 0 trained planning staff to implement DFC other than come and go planning directors. This has been an interesting read even though I do not live in Detroit I do have a basic understanding to the challenges facing the city. I still remember my wife asking me why I was so down on Detroit. My answer to her was it used to be a great city and over time it is no longer one. The one thing I took from comments was it needs imagination to move the city forward. Amen Over time with the right leadership it can happen. Dale Westrick concerned Michigan resident.